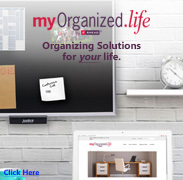 Did you ever think about organizing to get healthy? Maybe not, but as a professional organizer for over 10 years, I’ve seen a lot of kitchens and have realized that those clients who are healthy eaters have some things in common - their healthy kitchens contain clear and clean counter space, fresh food, a safe environment and open space. How do you achieve this “ideal” kitchen? Let’s start with establishing the function of a kitchen. For most people, the kitchen is where you cook and eat. Some entertain here, and others use the kitchen table as a home office or a homework area. It’s best to limit the functions of a room to prevent it from being too cluttered. Once you’ve decided the function, all items in the room should serve that function. So if you have a small table or desk, move the bill-paying and homework out of the kitchen to another room. Clear/Clean Counters – When organizing any room, start by clearing the surface areas. Take everything off, categorize it and decide what to donate or trash. When you are ready to put things back, the only things to keep out on the counters are those that you use every day. This might be a coffee maker or toaster oven or a crock of cooking utensils. Keeping a clear counter makes it easier to keep clean by wiping it down with soap and water once a day and disinfecting it once a week or after preparing raw meat. If you’re looking for a place to keep odd shaped appliances, under the sink works well. Most people keep cleaning products here but in the interest of safety, you should put cleaning products up high on a shelf. Fresh food - Food is the primary ingredient in a healthy kitchen so lets look at ways to keep it fresh. First, take all food out of the pantry, cabinets and refrigerator when you’re doing a major clean out. Check for expiration dates and mold on any food. These get tossed right away. Any left overs should go into clear, square containers preferably with a date on them so you can use them up within a week. Some citrus fruits can be left on the table in a bowl to make a pretty centerpiece and to make it easier for you to grab a healthy snack. And speaking of healthy snacks, make sure they are at eye level in the fridge and in the pantry. Make the bad food harder to find – if you have any at all! If you have children, make sure you have healthy snacks at their fingertips, especially after school. They tend to eat what they see first. 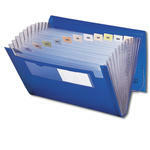 Safe environment – There are a few safety issues to consider when organizing your kitchen. First of all, sharp objects should be kept away from children and in a way that you can grab them without cutting yourself! Butcher blocks are great for keeping knives or you can get a knife sheath if you put them in drawers. Another consideration is food allergies. I once organized a pantry for a family with a gluten allergy, so all gluten free foods were put on one set of shelves and clearly labeled. That way the child could grab only those foods she knew she could eat. Cooking in the microwave is another area where safety comes into play. If reheating food, use ceramic or glass containers. Some plastics are not good in the microwave, so it’s safer to just use glass. Always put a cover on food that might splatter in the microwave, and make sure you stir it half way through the cooking process to help even out the heat. An easy and green way to clean your microwave is to put a bowl of water and vinegar in it and heat it on medium heat for 2 minutes. This will steam clean the inside so you can just wipe with a paper towel. Open space – It’s important to think about open space – in your refrigerator, on your counters and on your table! If you have space to see all the food in your fridge, you’re less likely to let it go bad. If you have clear counters and tabletops, you can keep them grease and dust free more easily. Kitchens with open space are more relaxing as well. Do dishes daily. Run the dishwasher when it’s full and hand wash pots & pans at night. Sweep the floor daily and mop it once a week. Keep a perpetual food list on the refrigerator or a bulletin board. When you run out of an item, put it on the list. Also add to the list any ingredients you need to make meals or special recipes. Take the list with you to the store to prevent over-buying. Put like things together in the pantry, cabinets and refrigerator. That way you can see what you have and grab what you want easily. Be creative with left-overs. Use one left-over food and add a fresh item for a meal that your family will enjoy. Before you go food shopping, put out all your half-finished snacks in a pretty serving dish so your family eats these before they dig into the new stuff! 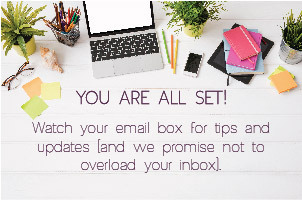 Even if you sort your mail or pay bills in the kitchen, make sure they have a home in another room so you can move them out at the end of the day. 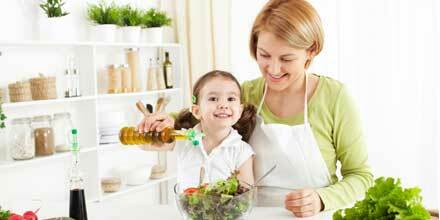 Try these tips and your kitchen will become the happy and healthy center of your home! 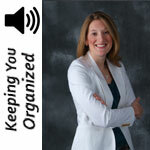 Watch or listen to Debbie's podcast on organizing a healthy kitchen. 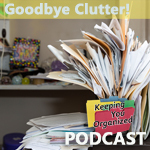 Debbie Lillard is an internationally recognized expert on home organizing, and has been featured on A&E’s Hoarders and HGTV’s Mission: Organization as well as radio shows across the US, Canada and England. Her practical approach to simplifying your life and her creative ideas make her a favorite with such national publications as: The Chicago Tribune, Better Homes & Gardens, Woman’s Day, and Disney’s Family Fun. Debbie has run Space to Spare, a professional organizing service in the Philadelphia area since 2003 and has three published books. Learn more about Space to Spare and Debbie by visiting www.spacetospare.com.